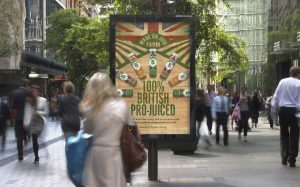 Cold-pressed juice brand B.Fresh will this month launch its first above-the-line UK-wide outdoor advertising campaign, as it seeks to actively celebrate its British, farm-made message. The campaign will run from 12 September with a £250,000 investment in street talker advertising positions, primarily in the South East, with extended reach in cities nationwide fully supported by digital activations. 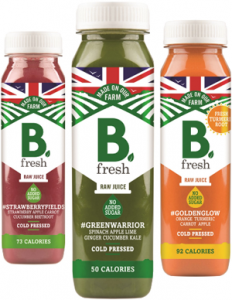 The adverts will be led by the tagline “made on our farm” and champion the fact that B.Fresh juices are “100% British pro-juiced” – a play on words with “produced” that also highlights the brand’s juicing credentials. The campaign will be fully supported throughout September with street sampling in key locations, along with a social campaign to attract consumers back into the category. The British juice brand, set up by third-generation farmer Philip Maddocks, will also release a pack refresh developed with design agency Grand Central Creative. The original pack has been injected with colour and features the full-colour Union Jack flag behind the “made on our farm” message to further reinforce the brand’s standout claims.